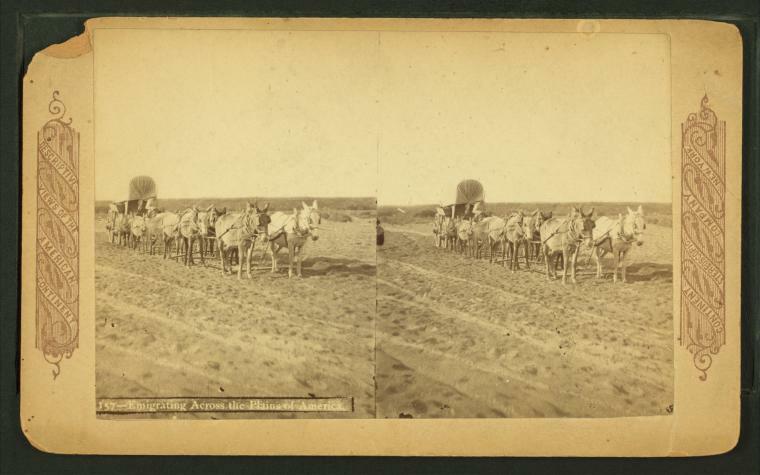 In the 19th century, the covered wagon was as ubiquitous as the automobile is today. It was the U-Haul moving truck of its time, which enabled our ancestors to push westward in their zeal to manifest destiny. 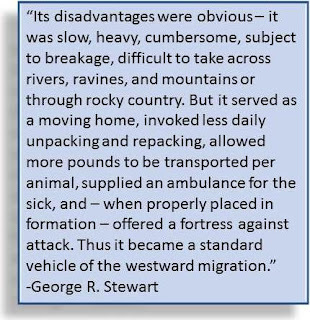 Most of our ancestors who migrated into the plains were not using large Conestoga wagons, but smaller vehicles with homemade canvass coverings. As George R. Stewart wrote in his 1962 article, The Prairie Schooner Got Them There, "The Conestoga was uselessly heavy for the long pull to Oregon or California." 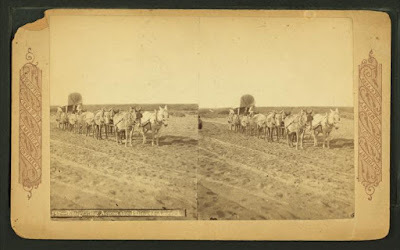 Pulled by teams of mules or oxen, these smaller covered wagons brought families and their every earthly possession to unsettled territory west of the Mississippi River - encroaching on lands occupied by Native Americans. My ancestors were among those who undertook arduous wagon journeys westward and settled on the plains. My 4th great-grandparents George and Amanda (Johnston) Hawks made a similar journey in October 1870. In September 1933, Mary Jane (Metzker) McCarty - a niece of George Hawks - wrote about the "three long weeks on the road" from Iowa to Kansas. McCarty, who as a young girl was part of that wagon train, said it was "the happiest time of my life. Our wagons were covered and we had a tent to sleep in at night when we stopped to camp." George Hawks' wagon was pulled by a team of mares named Flye and Lize and a colt named Frank. The horses struggled with the trek because "Some days were bad and some places the roads were just prairie, no tracks, and lots of places no bridges, and our oxen had to pull Uncle's (George Hawks) wagon out of a mud hole..."
When they reached the Missouri River at Brownsville, Nebraska, George "traded his horses for a team of work oxen just about a mile before we crossed the river, and the oxen he got were used to crossing on the ferry..." McCarty remembered that his oxen moved more quickly than the horses because they were better built to haul the wagon's bulk. Families like the Hawks often traveled in groups and created new communities wherever they settled. In the early 1830s, two sets of my 5th great-grandparents led a group of my ancestors on a wagon train from Tennessee to Arkansas. Henry and Mary (Counts) Bowen and John and Margaret (Bowen) McElhaney migrated over 600 miles west. Once they arrived at their final destination in Arkansas, they established the aptly-named township of Bowen in Madison County. 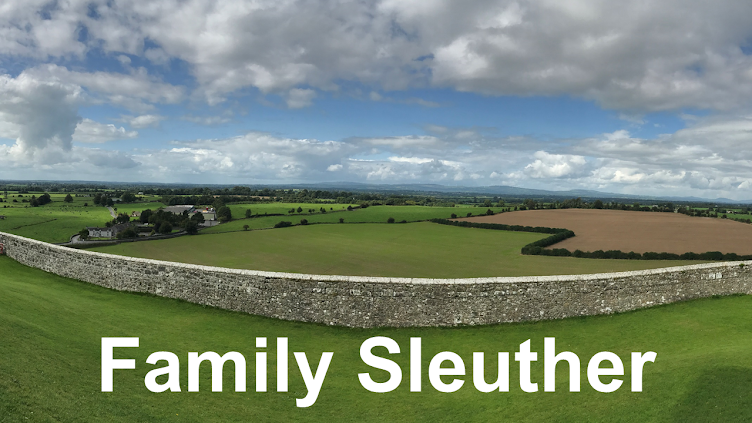 Modesty aside, it seems like a small concession to allow a family to name their settlement after themselves considering they traveled hundreds of miles on an unreliable and tedious mode of transport. 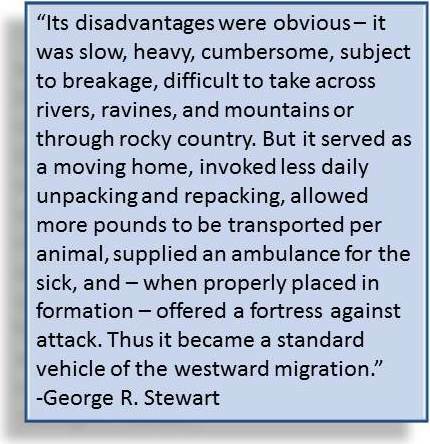 The covered wagon was an evolution of transport that enabled Americans - my ancestors included - to pick up and move their lives in search of new opportunities and horizons. It was a tool that sparked American wanderlust and established the movement of people as one of the most unique American traits - one that would rapidly expand in the early 20th century with the invention of Ford's assembly line. 2. Foreman, Grant, ed. Indian Pioneer History Collection. IPH 1–40, microfilm, 40 rolls. Indian Archives Division, Oklahoma Historical Society, Oklahoma City, Oklahoma. Did you ever visit the Oregon Trail museum in eastern Oregon? It really brings to life the journey of those pioneers. And outside the museum,you can see the actual tracks of wagons that went that way.